A Queensland Government health service’s success in reducing unnecessary pathology testing will be among a number of programs showcased at a national meeting in Melbourne today to mark the second anniversary of the Choosing Wisely initiative in Australia. Gold Coast Health, which encompasses Gold Coast University Hospital, Robina Hospital and a number of health precincts, has made significant reforms since engaging with Choosing Wisely Australia, launched by NPS MedicineWise in 2015. As previously reported at Croakey, the initiative helps health services, professionals, and consumers improve the quality of healthcare by discussing and eliminating unnecessary and sometimes harmful tests, treatments, prescriptions and procedures. Journalist Marie McInerney covered the meeting for the Croakey Conference News Service and reports on how Gold Coast Health, one of seven health services that have introduced key quality initiatives under the Choosing Wisely banner, has acted on unnecessary tests. Marie McInerney writes: Fifteen months ago on the Gold Coast, one of the busiest hospital emergency departments in the country implemented a pilot project to reduce unnecessary pathology tests. Other areas of Gold Coast Health that traditionally have had high volumes of pathology testing – obstetrics, gynaecology, haematology, respiratory medicine, general medicine, psychiatry and adult critical care – then followed suit. As well as more than 20 community health facilities, Gold Coast Health runs a 750-bed Gold Coast University Hospital in Southport and a 360-bed hospital in suburban Robina – which both have emergency departments run as one department. In just over 12 months, it cut the number of tests ordered across the hospitals by two per cent despite having a ten per cent increase in patient activity over the same period. The health service now orders an average of 93,500 public pathology tests a month, compared with an average of 96,000 public pathology tests previously, while at the same time caring for more patients. 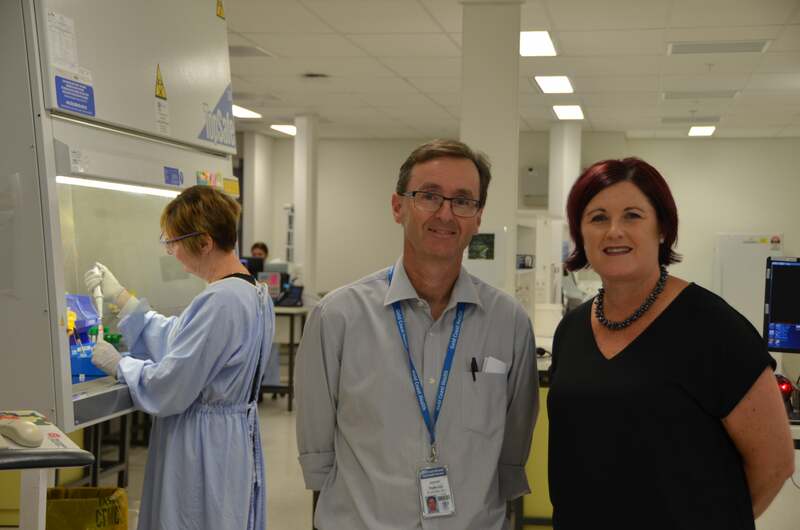 Haematologist Dr Jeremy Wellwood, who is clinical director of Gold Coast Health’s Choosing Wisely Pathology pilot project, said the results were impressive. “To have actually kept (testing rates) steady would have been a win in the face of that growth…so a two per cent cut is great,” he told Croakey ahead of a team presentation at today’s Choosing Wisely national meeting. Ordering a test that is unnecessary can lead potentially to unnecessary x-rays, procedures and treatments, he said. 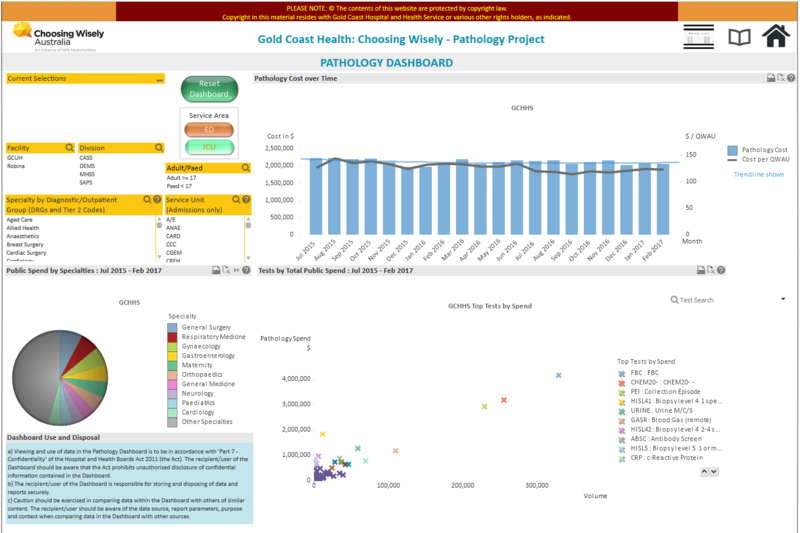 The service has developed a rich “interactive dashboard” (see picture below) of data sets showing each department their top public pathology tests by volume and cost, and how that compared to other facilities in Queensland. Gathering that depth of data, he said, has been perhaps easier than it might be in other jurisdictions because most of Queensland’s public pathology is run through Pathology Queensland, not a number of private services. That may also have contributed other benefits, he said. “You might think a pathology company would be interested in doing more tests, not less, but that’s absolutely not the case here, our pathology colleagues are very keen on not having unnecessary tests done on their patients,” he said. The emergency department, the “first cab off the rank” for the pilot, became a really good example of how a clinical team can come together with the right information and make sustained change, Wellwood said. The department has shown “no slippage” in ordering rates over the year since it began to identify and reduce unnecessary routine and repeat tests. Wellwood provides, as one example, how the dashboard showed high volume testing for C-reactive protein (CRP), used to identify the presence of inflammation. “It’s actually quite fascinating to watch, to have clinicians inside the room saying to each other ‘what are we ordering all that for?’,” he said. Wellwood, who is also a qualified pathologist, says there is nothing suspect about this type of over-testing; rather it just reflects how easy it is, particularly in a busy, stressful and often chaotic environment like an emergency department, to operate on “autopilot”. “It’s very easy to say ‘well, the last patient had this ordered, so I guess this would be what’s required’, (or) ‘I think my boss is going to want this test, (or) I’ve seen my buddy order it…”. In response, the emergency department was able, he said, to “hardwire” a reduction in ordering CRP tests by removing the test from the standardised hospital order sets. But other changes have come through education and “changing the culture” in clinical teams. He hopes that ultimately Choosing Wisely discussions will be a feature in medical schools. Gold Coast Health Choosing Wisely Pathology Project Manager Therese Kelly, who will also present at the meeting, said in a statement that the reduction in unnecessary tests was achieved through medical, nursing, and pathology representatives working together. To date there has been significant health and medical buy-in to Choosing Wisely. More than 130 recommendations have been made about tests, treatments, and procedures that healthcare providers and consumers should question since the initiative, which operates in more than 20 nations, was introduced in Australia. They have been developed from strong evidence by the 29 specialist medical colleges, societies and associations that support Choosing Wisely, with the latest recommendations ranging from considering the risks of operating on elderly people through to concerns about antibiotics and scans ordered for common ear, nose and throat conditions. 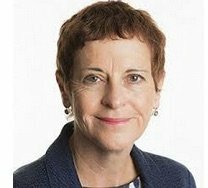 NPS MedicineWise CEO Dr Lynn Weekes said the standout results for Choosing Wisely Australia have been the level of engagement with medical and allied health communities and the level of implementation of recommendations, which has put Australia ahead of others internationally. “We’re not just talking about lists (of recommendations), we are actually seeing changes in our health systems,” she told Croakey. “This reinforces the long-term potential of Choosing Wisely to significantly change the mindsets and behaviours of health professionals and patients – to successfully challenge the notion that ‘more is better’ when it comes to managing a person’s health,” she said. While Choosing Wisely is welcomed by most in health care, there has been some criticism that, as one Canadian policy researcher put it, some recommendations target not even so much the low-hanging fruit, as 'fruit that’s rotting on the ground', such as to not do imaging for lower back pain unless there are red flags present. Weekes said there’s no harm starting with the low hanging fruit, particularly if it is not yet addressed. But she’s also confident that a growing trust and confidence in the initiative and the new (first) Australian Atlas of Healthcare Variation will deliver bigger benefits. The national meeting aims to get together engaged clinicians, to share experiences of what has worked and what has not, both in terms of engaging their colleges and getting change on the ground. It will also include two sessions on consumer engagement. “I’m also hoping that it does galvanise us to take two next steps: one around the higher hanging fruit and the other continuing to engage consumers,” Weekes said. While Gold Coast Health welcomes the “significant” cost savings that have been delivered through the pilot project by reducing unnecessary testing, Weekes emphasises that this is not the priority. She provides the example of one emergency department that reduced CT scans for suspected fractures, which reduced waiting lists and freed up the scanner for more urgent needs. “For practitioners, yes it saves money, but it actually means their workflow is better, they can provide better care, their day is easier and their patients aren’t stressed, waiting around to get the care they need,” she said. Hospitals and health services know they have a finite amount of resources, “so if they can find ways not to waste resources without impacting on patient care in a negative way, they’re going to be keen to do that”. Wellwood agrees that the focus is not financial, saying the Gold Coast Health pilot project did not set targets or KPIs. “If we weren’t able to reduce our pathology testing or if the data suggested we were already ordering as minimally as we can, we would have been content,” he said. In fact, he said, one department’s assessment was that it didn’t need change as it was below the benchmark on many measures and actually decided, as a result, to increase testing in one area. The challenge for Gold Coast Health now is to take the Choosing Wisely approach to pathology to other areas, such as imaging, the use of blood products, and antibiotics. That may require “different horses for courses” in how teams are engaged or data is designed and delivered, but the key principles of the pilot will stay. “It needs to be clinician led, data driven and, to be sustainable, it needs to have the buy-in, not only of executives, but also senior medical staff because they are the ones who can really have a major impact in really changing culture through the organisation,” Wellwood said.